Every year, the first Friday in June is National Donut Day…dedicated to celebrating one of America’s favorite sweet treats! I freely admit to having a soft spot in my heart for a comforting, warm glazed doughnut. 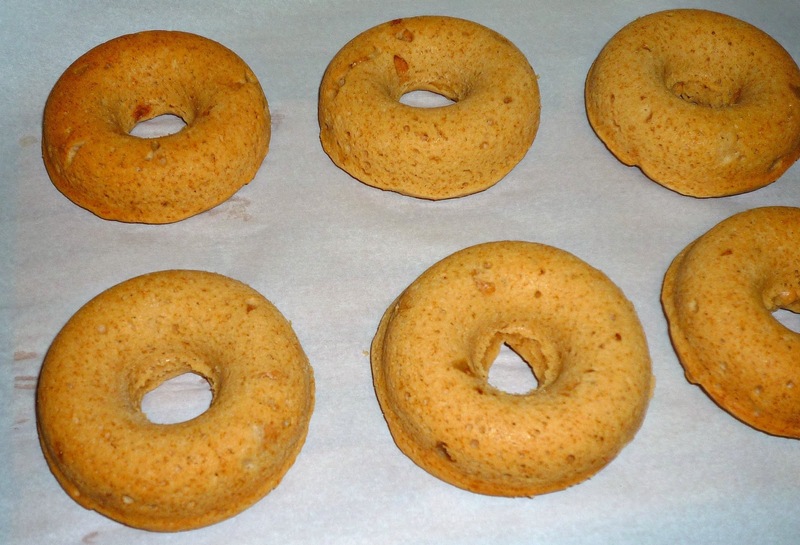 Making tasty baked cake-style doughnuts at home is a snap if you have a convenient 6-well doughnut pan in your kitchen. I don’t use my doughnut pan every day, but I love knowing that it’s in the cabinet waiting for when I feel like baking up some doughnuts. A special doughnut celebration calls for an equally special doughnut -- so I’m sharing some amazing Peanut Butter-Marshmallow Baked Doughnuts today! 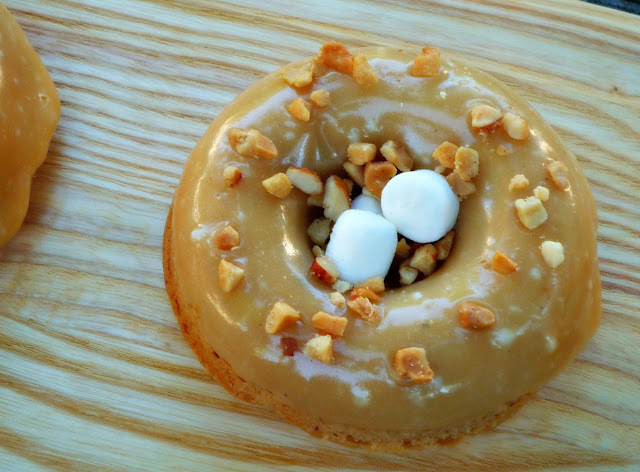 This doughnut is a spin on a favorite childhood sandwich, the fluffernut. 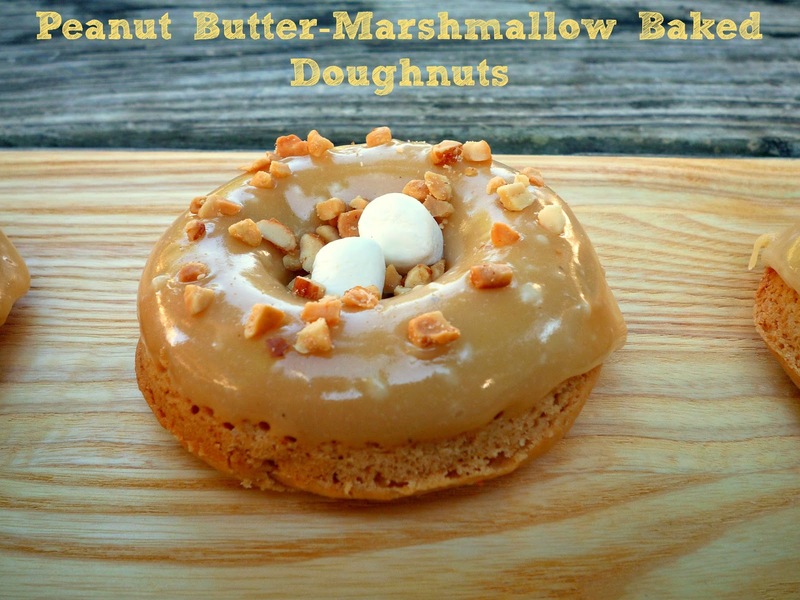 It features a peanut butter baked cake doughnut that’s topped with a peanut butter-marshmallow glaze. Then, I upped the peanut butter factor by adding peanut butter chips to the batter and peanut butter to the glaze. I topped the doughnuts with chopped peanuts and a few mini marshmallows for extra flavor and texture. 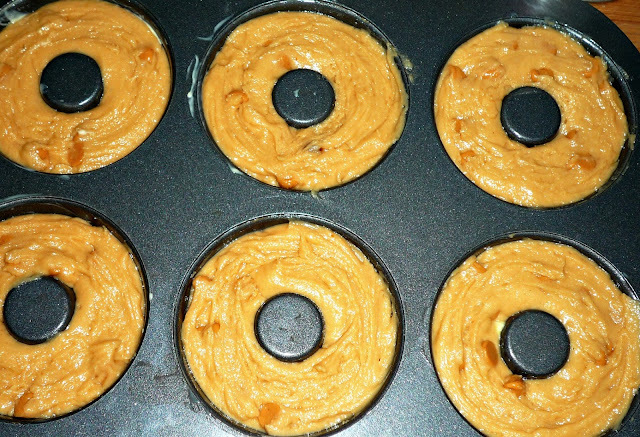 If you’re a peanut butter lover, you’re going to go crazy for these fun doughnuts! They go especially well with a glass of ice-cold milk to wash them down. Let me show you how easy it is to whip up a batch of these fun doughnuts for your own National Donut Day celebration! Step 1: Preheat the oven to 350. Spray the wells of a doughnut pan with non-stick spray. In a large bowl, add the peanut butter, Greek yogurt, and brown sugar. Whisk until the mixture is thoroughly combined and creamy. Then, whisk in the egg, milk, and vanilla until completely incorporated. Finally, add the flour, baking powder, and salt. 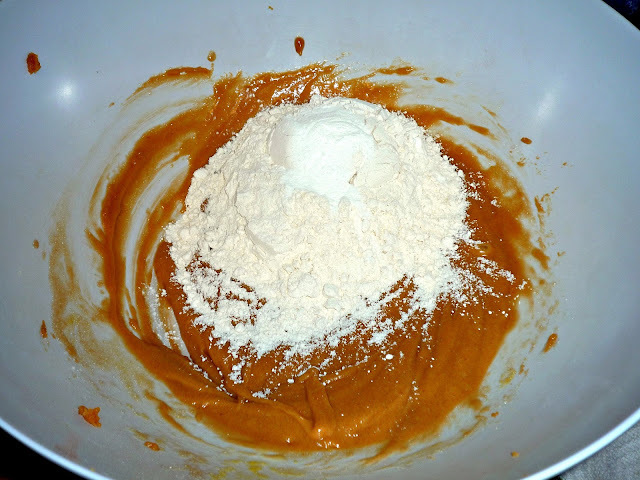 Step 2: Mix in the dry ingredients until they are just combined into the batter -- don't overbeat! 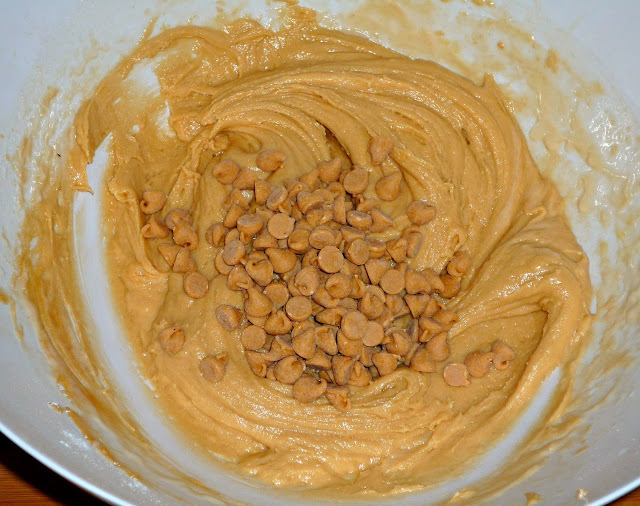 Add the peanut butter chips to the batter and stir into the batter. Spoon the batter into a large ziptop bag and snip 1 inch off of the corner. 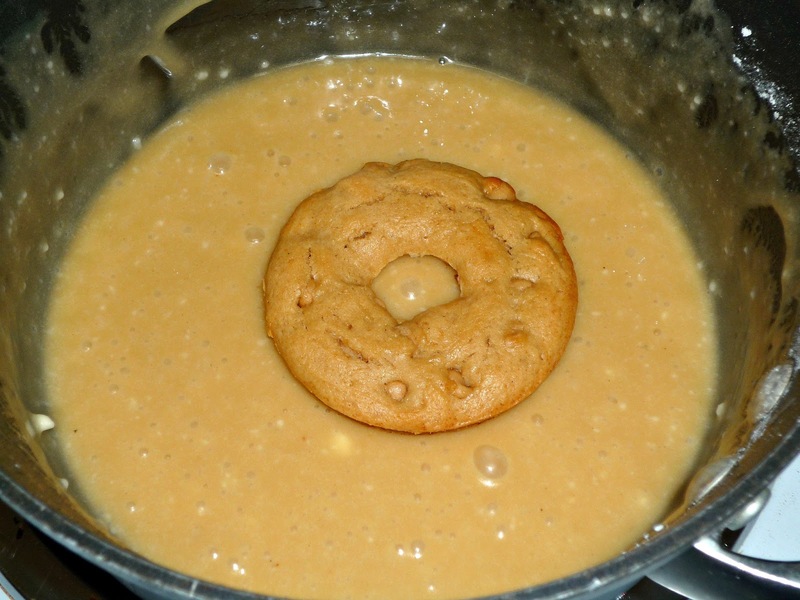 Carefully pipe the batter into the doughnut pan. Tap the pan on the counter until the batter evenly settles into the wells. Step 3: Bake for 10-15 minutes, until a toothpick inserted comes out clean. Cool in the pan for 3 minutes, then turn the doughnuts onto a sheet of parchment. While the doughnuts cool, make the glaze. Add the butter, water, and vanilla to a medium non-stick saucepan over medium heat. Cook until the butter melts, then add the peanut butter and mini marshmallows. 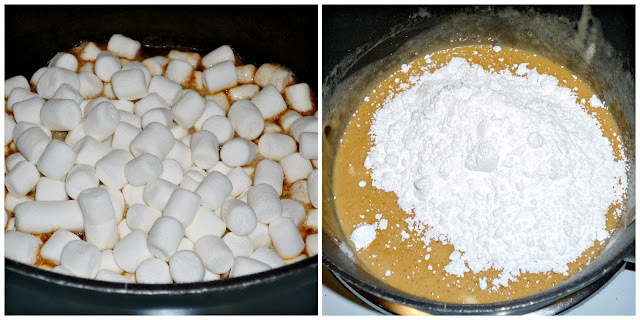 Whisk continuously, until the peanut butter and marshmallows are melted and combined with the butter mixture. Finally, add the powdered sugar and whisk until a thick glaze is formed. Step 4: Dip the rounded end of the doughnuts into the warm glaze, shaking to remove any excess glaze. Place the doughnuts glazed side up and immediately sprinkle with the chopped peanuts. Finally, place 3 mini marshmallows into the hole in the center of a doughnut. Let the doughnuts cool for 5-10 minutes, until the glaze has a chance to firm up. If you're not eating them immediately, store covered. These doughnuts are bursting with peanut butter flavor! The doughnuts are moist and cakey, and the decadent peanut butter-marshmallow glaze provides a perfect sweet punch. The peanut and marshmallow garnishes provide a bit of fun texture, as well as an extra pop of flavor. Because these doughnuts can be whipped up in about 45 minutes, why not whip up a batch of these today to celebrate National Donut Day too? If your kids are already home from school for the Summer, this would be a fun project to do with them – they’d have a blast glazing and decorating the tops of the doughnuts!